Update: This review may be revised in the near future, stay tuned. So, I finally review the new line of Haagen-Dazs ice cream. I couldn't wait to try it as soon as I saw it on the website, and then I bought it as soon as I had a chance. I love brown sugar ...so what happened?? I don't really know, all I know is that one word comes to mind: DRY That's right, dry. The molasses is so potent that it totally ruins the ice cream for me. I didn't think you could make ice cream taste like this way but they made it happen. I'm totally, completely, absolutely, disappointed. My hopes and dreams dashed by my very first bite. Am I being too harsh? honestly? I don't think so. Short of drinking straight from a bottle of molasses (which may work for some of you), I ...I ...I can't even finish my sentence ...apparently I'm speechless! ok, not really. Have I mentioned how dry it tastes? I got opinions from my wife and daughter and they too were "unamused". I'm still debating what I can mix this with to save it. I added some whip cream, which did help, but this is Haagen-Dazs, it's not suppose to need help. I'm sorry to be so harsh but I don't know what else to say. On Second Scoop: Well, the story doesn't really end here. Check out the stunning conclusion to my introduction to this new line of ice cream. As far as the brown sugar goes, well, I despise it, I tried it one more time and I refuse to eat any more of it. Spoons permanently down on this one. if you want to get technical, then shouldn't the flavor be called Molasses and not Brown Sugar? Have to say I loved it too. It tasted warm and toasty. I will agree that their brown sugar was definitely heavier on the molasses the typical light brown but totally right for the less used dark. So if they called it dark brown sugar maybe a compromise could be reached. in the "name of science" (and too make sure I'm not crazy), I ate a teaspoon of dark brown sugar after the original comment was posted. You can taste molasses but it's more sugar than anything, and that's what I expected in the ice cream. I'm sorry, but I sooo disagree with this as well! I am not even an ice cream eater (my hubby is) and he bought some of this and I was totally HOOKED at first bite! I literally CANNOT put this stuff down. It is utterly, totally amazing! Seriously, it's just delicious! I have told everyone I know about it and so far everyone that's tried it absolutely loves it!! To me the flavor was more caramel than molasses. I really liked this a lot. It's delicious on top of apple brown betty. Very smooth and creamy too! i will agree with you on this one. the taste is definitely overwhelmingly molasses, and the texture is just not right. i'm not sure if the carton i bought had maybe melted and was refroze, but the texture was kind of crumbly and not at all pleasant (so much so that i arrived at your blog by searching for 'haagen dazs brown sugar texture'). all that being said, i DID finish it. i mean, it's still ice cream! i just won't be buying it again. i should have gone with my first inclination of trying the ginger flavor. I actually loved the crumbly heavy brown sugar tasting version and was disappointed when I got another pint that was nothing but creamy and almost too consistent throughout. Two pints that I had initially were crumbly in texture and slightly darker in color. When I bought it again, the lighter color concerned me; upon first taste - the crumbly texture was gone. Compared the to my initial experiences with this flavor the smooth, lighter version is very undesirable - much more boring on the tongue. By the way - in addition to loving the crumbly texture, darker color and heavy molasses flavor I also like to pair this flavor with the five coffee flavor. YUM. Agree with original post, I can't believe most everyone else gives it a thumb (or spoon) up -- it's not the flavor (to me), it's the texture. Offputting from the very first spoonful. Chalky and tongue/mouth-coating, and not in a good way. Like Ikes I found this space by searching online under the HD line and flavor. How anyone could find this creamy and smooth is beyond me. It feels like it's got cornstarch stirred into it. I completely understand why the Brown Sugar flavor is a turnoff for most people. It DOES make your mouth dry, and it DOES taste like burnt molasses. But gosh darnit I love it!!! All other ice cream flavors are now inferior in my eyes. Alas, due to a lack of sales, Brown Sugar is now discontinued. :( So, all of you that hated the flavor, give me your half eaten containers! I'm jonesin hard! Yeah, the Brown Sugar was awesome. but it looks like H-D did away with it. That's a shame. I love this flavor and greatly disappointed that Central Market in Austin stopped carrying it. as far as i can tell the brown sugar flavor was discontinued after one bad review! Every time I tried to buy it after my first container, it was all out!! What does that say? It is fantastic I could eat it by the container! what sour taste budded person wrote that review anyway? Hi Everyone. I lot of people came to the defense of this flavor so that's why I need to reiterate: Haagen-Dazs had major trouble producing this ice cream. While some pints came out great, others were turning out like the one I had. They went temporarily offline with it but never resolved the issue. That's why it's discontinued. 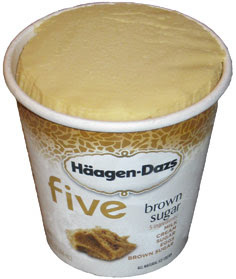 I see this is an old thread, but I love Haagen-Daz Brown Sugar. It's one of my favorites. I can't find it this year, however.